The Sea Level Rise Viewer is an online simulator that show potential sea level rise and coastal flooding impacts for coastal areas in the United States and territories (with the exception of Alaska, due to the lack of sufficient statewide coastal elevation data) under different sea level rise scenarios. The viewer can be accessed via a computer or a mobile device. The user is able to select a sea level rise scenario ranging from one to six feet above the average highest tide level; the tool then shows coastal areas likely to be impacted by flooding under the selected scenario. The tool also has additional data, such as potential marsh impacts and marsh migration due to sea level rise, flood frequency, and predicted socioeconomic vulnerability for the affected areas. In addition to the maps, the tool provides textual explanations for each scenario explaining potential impacts. For certain locations, the tool contains images depicting sea level rise and flooding impacts, which can be used to see how various iconic landmarks are affected by sea level rise. The tool also offers links so that users can access more information about relevant issues, such as IPCC sea level rise projections, coastal sensitivity to sea level rise, and a social vulnerability index. Example in use: The Sea Level Rise Viewer has been applied in many different contexts (see http://coast.noaa.gov/digitalcoast/tools/slr for a full list of sites and projects). For instance, in Cape Canaveral, Florida, the viewer was used to create a map showing potential sea level rise impacts along the coast for a sea level rise scenario of 3 feet by 2100 and compare these changes to current coastal maps and an aerial imagine from 1958. The map highlights how sea level rise could impact important coastal development and infrastructure, like the John F. Kennedy Space Center, as well as protected areas like the Merritt Island National Wildlife Refuge and the Canaveral National Seashore, which provide habitat for bald eagles, alligators, manatees, shore birds, and other species. Similarly, in South Carolina, the Sea Level Rise Viewer was applied to look at historical flooding trends in Charleston. Current data of areas that are vulnerable to coastal flooding were compared to city maps from 1863 and used to show that areas that currently vulnerable to flooding used to be creek and marsh lands that were filled in as the city expanded. This application demonstrates how data from the Sea Level Rise Viewer can be used to explain current flooding trends and predict future vulnerability to sea level rise. 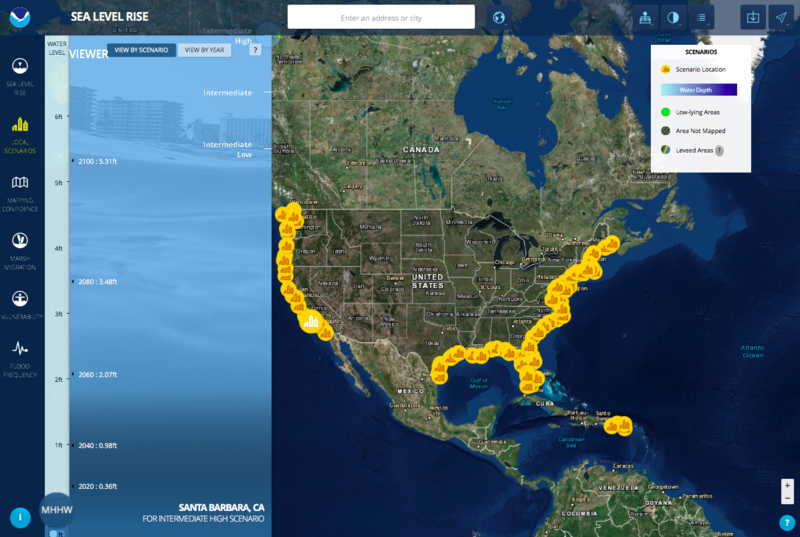 Being able to visualize potential impacts from sea level rise is a powerful teaching and planning tool, and the Sea Level Rise Viewer brings this capability to coastal communities. A slider bar is used to show how various levels of sea level rise will impact coastal communities. Additional coastal counties will be added in the near future. Maps are not currently available for Alaska and Louisiana due to elevation data accuracy, hydraulic complexity, and vertical datum transformation gaps. This organization was established in 2014 when NOAA combined two offices: the Coastal Services Center and the Office of Ocean and Coastal Resource Management. The basic missions of the two programs remain intact, but the new organizational structure is bringing value-added services to taxpayers.